Looks like a root canal. You’re not the same person you were as a child, not ten years ago, not one year ago. Not even a day ago. Thoughts change. Convictions, too. Tastes. Body shapes. Hairstyles. More subtle are the changes hidden from the naked eye, the cells that grow and metastasize or die. 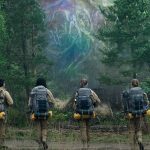 It’s impossible to watch Annihilation, the sophomore effort from writer-director Alex Garland, and not have such heady thoughts afterward. 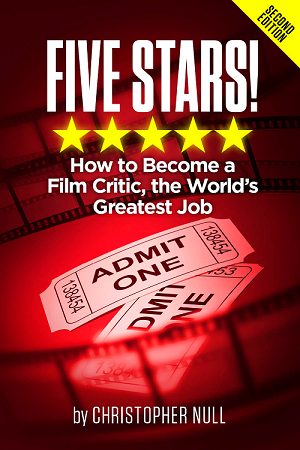 The film floats these questions like pollen on a spring breeze, affecting you without your realizing it at first. It’s also suspenseful and creepy, visually lush, dreamlike, and mind-blowing. Sci-fi lovers seeking a good cerebral adventure will enjoy it immensely. For three years, military teams have breached The Shimmer to reach the lighthouse as the phenomenon continues to grow. But no communication signals can penetrate it, and no explorers have ever returned except for Kane (Oscar Isaac), a soldier used to special ops but who now can’t recall how he found his house once he arrives there. He swiftly falls ill with multiple organ failure, leaving his biologist wife, Lena (Natalie Portman), an Army vet herself, full of questions and a desire to save him. Lena joins the latest expedition, not only all women but scientists armed with assault weapons. Ventress (Jennifer Jason Leigh of The Hateful Eight and TV’s Twin Peaks) is a psychologist. Anya (Gina Rodriguez of TV’s Jane the Virgin) is a paramedic. Josie (Tessa Thompson of Thor: Ragnarok and TV’s Westworld) is a physicist. 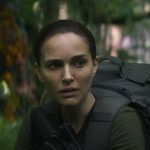 Portman (Jackie, Black Swan) earns our allegiance with her natural intelligence and empathy, but the others also carve out clear personalities, especially Rodriguez, whose character’s profanity generates some laughter among the tension as their mission unravels. Garland has been tooling around in sci-fi since writing the screenplay for 2002’s 28 Days Later... In his directorial debut, 2014’s Ex Machina, he staged a battle of wits inside an isolated house among an inventor (Isaac), his employee (Domhnall Gleeson), and a humanoid artificial intelligence (Alicia Vikander). The AI wanted her freedom, but the film percolated with ideas about the nature of humanity and about who’s playing whom. Here, Garland tracks in similar doubts and deceptions—the women wonder whom they can trust—but the mystery of The Shimmer drives the story. Under Garland’s assured direction, that takes time to unfold, but the careful pace never feels boring. 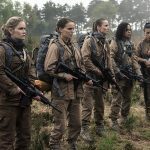 Annihilation builds suspense, making the action and revelations startling. Garland doesn’t go for jump scares (well, maybe one). Instead, his horror blends gore—and there is gore—with uneasiness, those back-of-the-mind fears. The spouse unlike himself. The colleagues acting dodgy. Even a landscape blooming in unprecedented ways. There’s little background music or ambient sound within The Shimmer, where cinematographer Rob Hardy (Ex Machina) plays with light and reflections beyond just filtering sun through tree branches. Nature feels as if it’s swallowing the landscape itself. Is this a suicide mission? Or are humans naturally self-destructive? One character poses the question, noting how people tend to sabotage the good job, the happy marriage. Viewers will learn what’s happening within The Shimmer, but Annihilation also is about how we react to change itself. That leaves no easy answers. Do we run from change? Analyze it? Fight it? Or embrace it? No matter what you choose, it will affect you, anyway. Are you the same person you were when you started reading?